May we suggest that you stay in our 17th century inn situated in the forest of Amboise on the road to the world famous Château of Chenonceau, Amboise is the center of all the Loire Valley. Comfortable Bed and Breakfast rooms, swimming-pool,ping-pong, close private car park, Dinner on the terrace in the summer and by a fireplace in the winter. former 17th-century hunting lodge, this inn, in the heart of the Amboise forest, is an ideal base for day trips (2km from Amboise and 4km from Chenonceaux). Simple rooms, off the beaten track. Try some classic old-fashioned dishes in the restaurant. 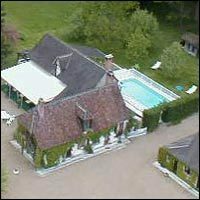 Helicopter trips over the châteaux can be arranged. Canoë kayak on the Loire. Loire Valley Bicycle, ZooParc of Beauval. Your host is amongst the best 50 B&Bs in France who have been awarded the ‘Golden BAB sign-2008’. Dinner is available if booked in advance. 2 km after the parc of mini-châteaux.